Researchers at St. Jude Children's Research Hospital have discovered that a protein critical to a process called liquid-liquid phase separation within the cell undergoes internal changes in conformation that are key to its function. The protein, nucleophosmin, is a kind of "smart glue" in a structure called the nucleolus inside the cell's nucleus. In the nucleolus, nucleophosmin helps organize and regulate the construction of ribosomes—the biological machines that assemble proteins using their RNA genetic code as a guide. Nucleophosmin is critical to the liquid-like structure of the nucleolus called a membrane-less organelle. That is because unlike cell structures like the nucleus, the nucleolus is not enclosed in membranes. Instead, the nucleolus and other such organelles are something like the colorful undulating blobs in lava lamps—dynamically forming, shifting and fusing. The paper describing the "self-interaction" of nucleophosmin was published in the February 26 issue of the journal Nature Communications, by a research team led by Richard Kriwacki, Ph.D., a member of the St. Jude Department of Structural Biology. In earlier studies, Kriwacki and colleagues had discovered how nucleophosmin binds to proteins and RNA to foster phase separation, as well as ribosomes' assembly. However, their studies of nucleophosmin were yielding results hinting that its "heterotypic" reactions—those with proteins other than itself and RNA—did not fully explain how part of the molecule called the intrinsically disordered region functioned. "The results were not fitting our previous model for how this domain was mediating phase separation," Kriwacki said. "This led us to an alternative hypothesis that this region was undergoing conformational changes and interacting with itself." In further experiments, first author Diana Mitrea, Ph.D., a staff scientist in Kriwacki's laboratory, explored the mysterious mechanism. The experiments point to how the intrinsically disordered region undergoes changes as ribosomes are assembled and the makeup of the nucleolus changes. The changes were to increase homotypic interactions, or within the nucleophosmin molecule itself. The research also revealed how nucleophosmin interacts with another protein called SURF6. Scientists discovered SURF6 acts as a partner to nucleophosmin in creating and maintaining the loose scaffolding that holds the fluid nucleolus together. "Once we realized it was happening, this self-interaction didn't seem so surprising, because other such disordered proteins we had studied had been shown to undergo phase separation through such homotypic reactions," Kriwacki said. The experiments revealed important new details of the mechanism by which the smart glue nucleophosmin changes its internal conformation as the liquid-like nucleolus facilitates ribosome assembly. At an early stage of the process, its primary job is to shepherd RNA and proteins to assemble ribosomes. But as the glue molecule hands off its cargo as ribosomes form, the glue molecule adjusts itself homotypically to interact with other glue molecules. This cross-linking of nucleophosmin proteins constitutes a kind of buffering, in which nucleophosmin helps maintain the liquid consistency of the nucleolus. In this buffering, the homotypic mechanism competes with nucleophosmin's heterotypic mechanisms by which it attaches to RNA and proteins in helping assemble ribosomes. The insights into nucleophosmin's role in the nucleolus will offer broader insights into the mechanism of phase separation in other membrane-less organelles in the cell, Kriwacki said. The research could also have important clinical implications, for example in understanding the molecular basis of amyotrophic lateral sclerosis (ALS), or Lou Gehrig's disease. St. Jude molecular biologist and chair of the Department of Cell and Molecular Biology, J. Paul Taylor, M.D., Ph.D., has identified an abnormal building block of membrane-less organelles called stress granules that underlies ALS. Kriwacki and his colleagues are working to understand how that abnormality relates to nucleophosmin's function in the nucleolus. Drs. Taylor and Kriwacki previously reported that a different abnormality associated with ALS, expression of so-called toxic dipeptide repeats, affects nucleophosmin's nucleolar function and inhibits ribosome assembly. Also, mutations in nucleophosmin are the most frequent molecular abnormalities in adult acute myeloid leukemia. 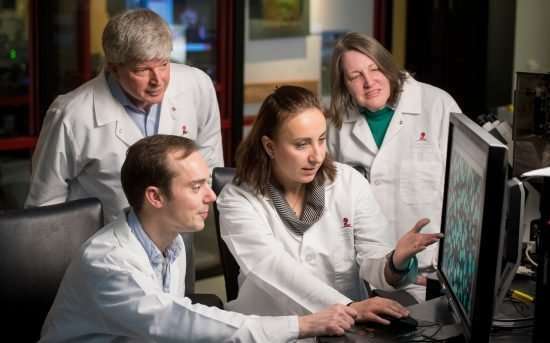 In future studies, Kriwacki and colleagues plan to explore how the abnormal nucleophosmin drives the leukemia.